Marvel’s biggest blockbuster of 2016, Captain America: Civil War, is only a few months away. In this exciting new film, the government is becoming concerned with the collateral damage caused by the Avengers and decides to politically interfere with the Avengers’ activities, which divided Captain America and Iron Man over the accountability of the Avengers. 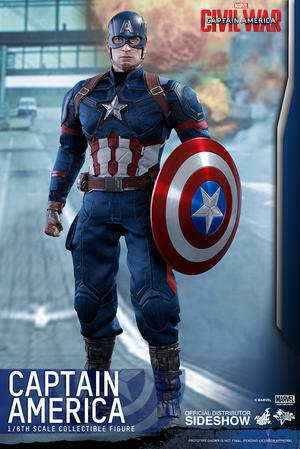 Sideshow and Hot Toys are very excited to present the new sixth scale figure of the main character from the film – Captain America Steve Rogers! 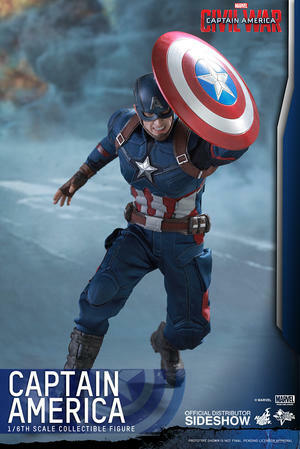 The movie-accurate Captain America Collectible Figure is specially crafted based on the image of Chris Evans as Captain America/Steve Rogers in Captain America: Civil War. 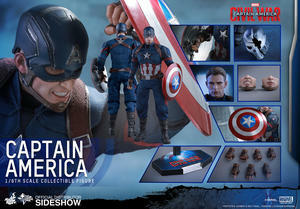 It features a helmeted head sculpt with two interchangeable lower faces, a newly painted un-helmeted head sculpt of Steve Rogers, a newly developed body that naturally portrays Captain America’s muscularly toned body, a completely new Captain America suit, a metal circular shield, a broken Crossbones helmet, and a specially designed Captain America: Civil War themed figure stand! 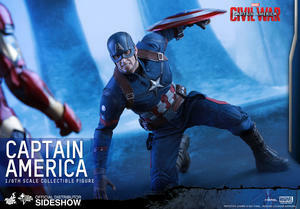 Don’t miss the opportunity to add the leader of Team Captain America to your collection today.